Whether you got married 3 weeks ago or 30 years ago, you may very well still have your dress sitting in a closet somewhere. This is one of those things that tends to get carried from house to house. Some of us have a lot of emotional attachment to the dress. Some of us have hopes that a family member will want to wear it someday (though I think if you got married during the age of super synthetic dresses, the odds are low). Some of us just don't know how to get rid of it, because throwing it out feels wrong. Wedding dresses are a pretty environmentally tricky purchase- you spend a lot of money on something that will only be used once. I know I looked at lots of used dresses, but never had the nerve to buy one that way. Now, I think I might have gone about it differently. I did end up with a dress I loved, but in the end, I am not sure it made that huge of a difference. This blog covers a lot of territory on shopping more ethically, but one of the most eco-friendly things you can do is to have less and to get rid of things in an ethical way. Sure, maybe someday your daughter will want to wear your wedding dress (she won't) but in that time, that dress could have lived multiple lives or multiple weddings. In an ideal world, we would all be way more willing to let things go, because the more used stuff is out there, the more we can all invest in secondhand instead of more brand new stuff that will land in a landfill. So, the question becomes, where can you offload that wedding dress? Once Wed was my favorite place to browse dresses, and I think you can resell decor as well. Honestly, if I could do it all again, I would probably buy a dress from here. Preowned Wedding Dresses is probably the most commonly used, though I tried to sell a dress on here and it never worked out. Still, if you have a recent dress that someone can still go to the store and try on, you might have a lot more luck than I did. Adorned in Grace, based in Northern Oregon and Southern Washington, sells bridal and formal wear (so maybe somewhere to donate all those bridesmaid dresses?) to raise money to help women once caught in human trafficking and to raise awareness of the epically huge problem. Pretty awesome cause if you ask me. Your dress gets a second life, AND you get to help other women. So cool. I think I will send a few old prom and bridesmaid dresses their way. Angel Gowns breaks your heart and makes you feel better about the universe at the same time. These organizations take donated wedding gowns and turn them into dresses for stillborn babies or babies that pass away. If your dress is older and you don't think some of the other organizations would want them, look into the multiple angel gown organizations to give a special gift to parents going through something truly awful. Brides Across America is incredibly cool because it doesn't sell your dress, it gives it away to a military bride planning their wedding (a big challenge when your fiance is serving far away). This charity has given away wedding gowns to 12,000 brides in events all over the country. What a cool way to say thank you. They only accept dresses five years old or younger, so stop wringing your hands and go for it already. 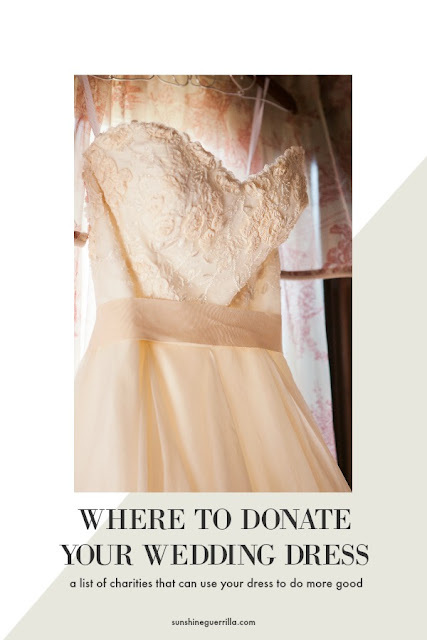 The Bridal Garden- If you are shopping or donating in the New York City area (looking at you, Kleinfeld shoppers), the Bridal Garden sells wedding dresses to benefit underserved children in the New York area. Give them your dress or start your shopping there instead of the big salons. Brides for a Cause is a huge and very successful consignment salon that sells their dresses "for charity" It felt a little vague to me (ok, a cause, but which one? ), but they do donate to Brides Across America right now, so you are still contributing to a very positive mission by donating your dress to them. I love it. The Brides Project in Toronto sells the donated dresses with the profits all going to cancer charities; this store has already put 600,000 dollars into cancer charities! That's awesome! Success in Style is a Baltimore-based organization that gives out of work individuals wardrobes to help in their business lives. They have a consignment store to fund their mission, and now they accept wedding gowns for their wedding consignment store Cherie Amor. Wish Upon a Wedding gifts weddings and vow renewals to men and women (regardless of sexual orientation, which I think is especially important) suffering from terminal illnesses. I am looking around, and I am not positive they still accept dresses, but if you can't donate your dress, you could still sell it and donate the proceeds. I know I had a dress I bought on super clearance panic(like 70% off?) that has been sitting in a closet since 2012. It wasn't my dress. I offered it to women in my family, wasn't theirs either. I gifted it to a woman in my Buy Nothing group when she asked, and she looked so fantastic in it. She told me she donated it so someone else could use it as well. 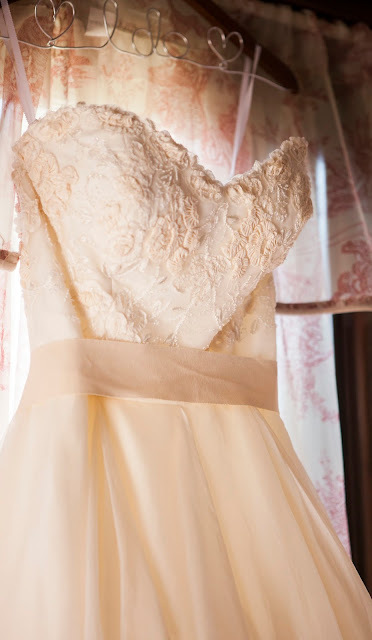 I feel so much joy about this dress- it feels freeing to know it helped another bride. It felt so good in fact that I am considering giving away my dress as well. Really, what is the point in keeping them? So kudos to you if you give your dress away or even sell it so another bride can use it. Such a cool thing to do. When you see all these things your dress can do, it seems like it is really underperforming in your closet, right? I know I struggle with the idea of parting with my dress, and I don't know if I will muster the courage or not, but the more dresses get multiple uses (and do all these wonderful things for people who need them) the better for everyone. That dress is so pretty! I don't think I've ever seen that picture before. Thank you very much for this! I still have my wedding dress and I got married 6 years ago! I absolutely LOVE this idea. I would so much rather let someone else get use out of my dress than have it sit in the back of my closet until my daughters decide they want to choose their own dresses! Donating your wedding dress is such an awesome idea. There are so many people that could get use out of it!